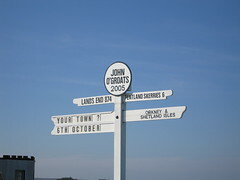 Driving back from Yate down Sandpits Lane, I slow down to read a message on the backpack of a lone walker: “Land’s End to John O’Groats – for Derby Cancer Research”. Is he lost? I wonder, and stop the car for a chat. Not at all, it turns out. Chris, for that is his name, has just chosen a spectacular route for his epic journey, including the Cotswold Way. (He’s clearly a man of taste.) I slip him a few quid for his sponsorship fund and invite him to my house for a cup of tea, if he feels like making a detour. Realising it would be cheating if I offered him a lift, I drive off, and that is the last I see of him. Well, you can never have too much cancer research, can you? This post was originally published in the May 2010 Hawkesbury Parish News.